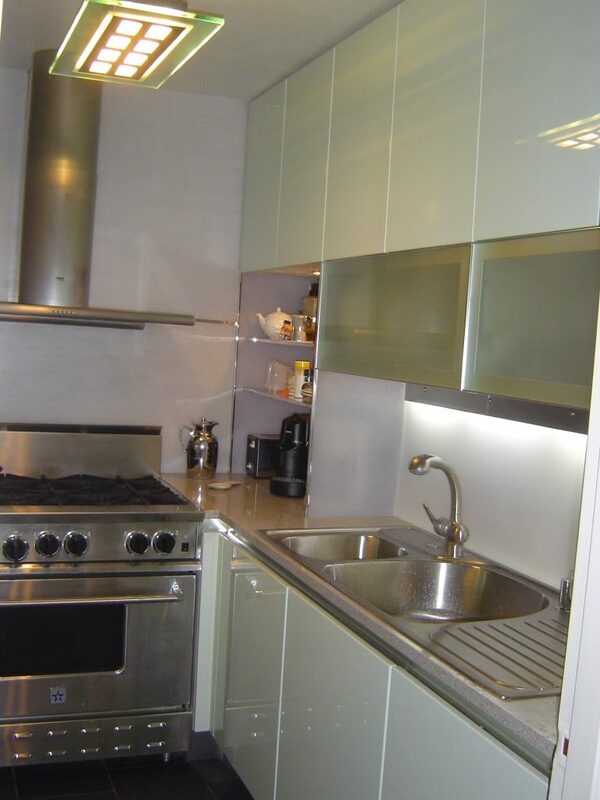 This petite Upper West End kitchen packs an enormous wallop in a small space. 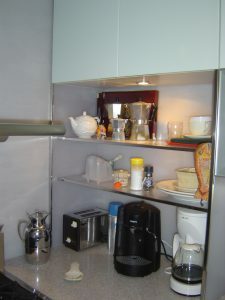 Fresh pastel colors define the space, as seafoam green doors, self-closing drawers, and upper cabinet glass vitrines intermingle with high-end stainless steel appliances. 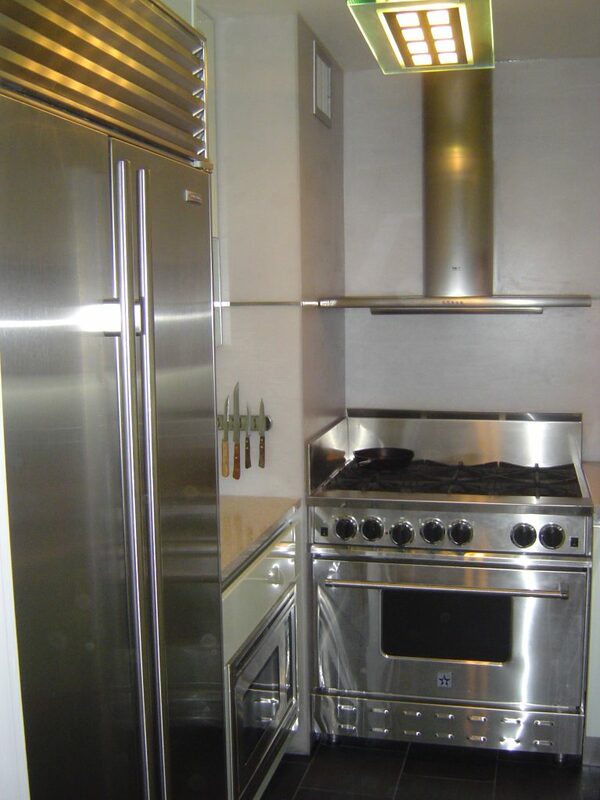 There is a Blue Star Oven with convection and exhaust hood starring as the main focal point front and center, with a built-in DCS microwave oven in the base of the cabinet to the right of the 36” Sub Zero refrigerator. 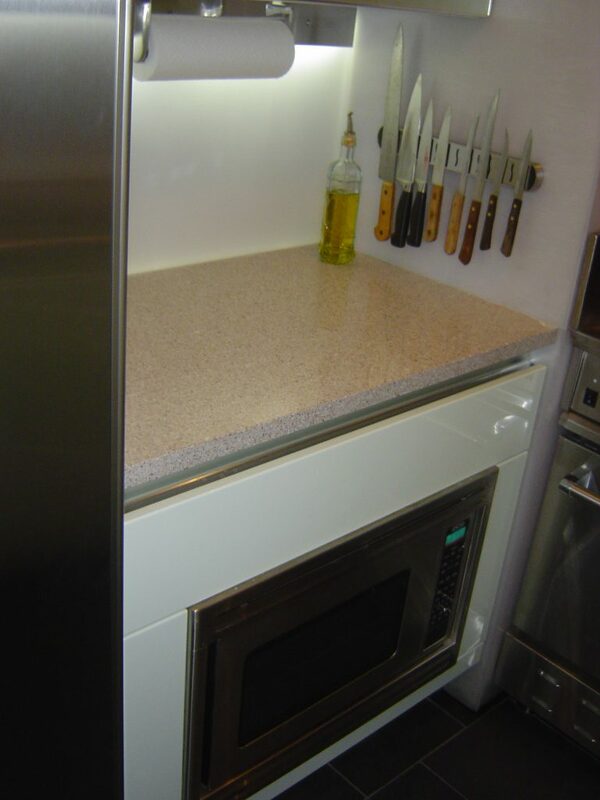 A Miele dishwasher is concealed behind the first bottom seafoam door of the right base cabinet. 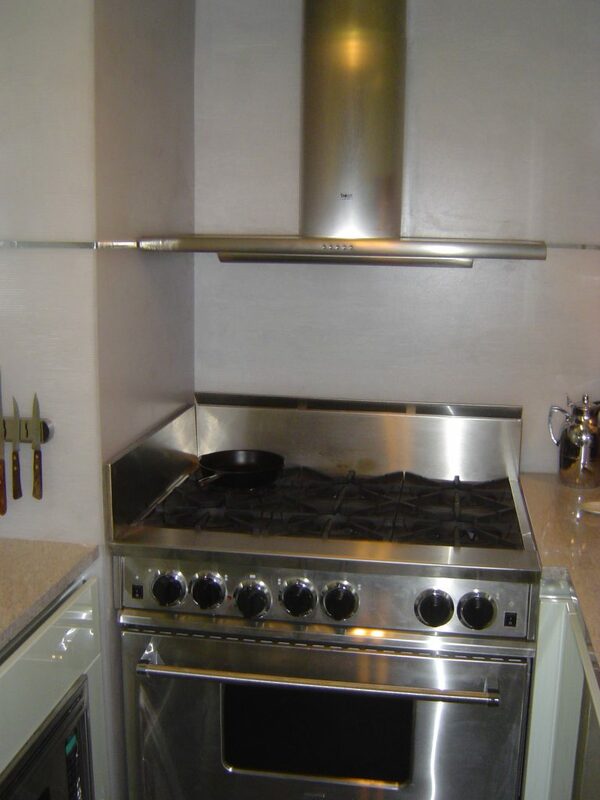 Special 3-Form translucent paneling was used along both flanking exhaust hood walls with horizontal aluminum extrusions in between. 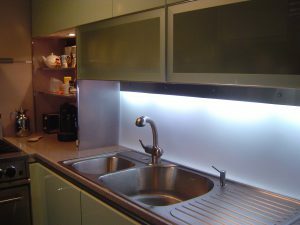 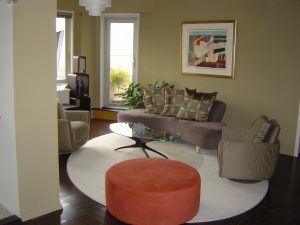 The same paneling was used as a back lighted back splash for effect. 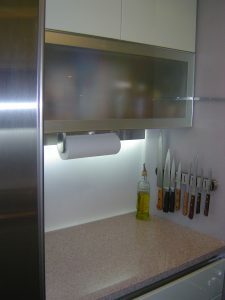 Light grey granite countertops float above the seafoam cabinets, while framing an over-the-counter stainless steel faucet and sink. 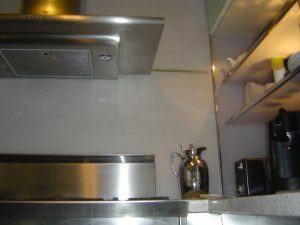 There is an open lighted pantry unit built-into the upper cabinet to the right of the oven. 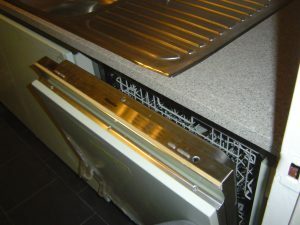 There is a stainless steel dish drying rack built-in to the bottom of the glass vitrine above the sink. 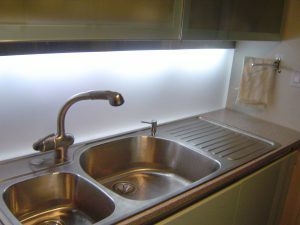 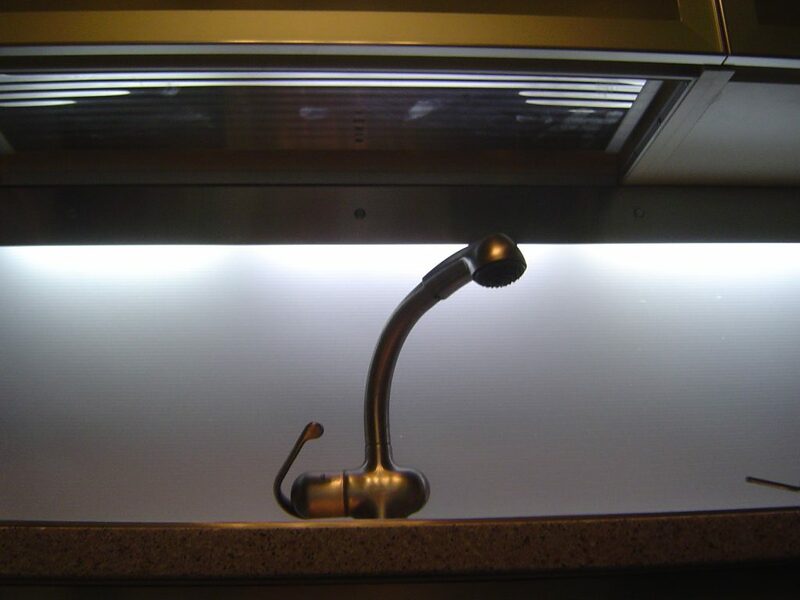 Under upper cabinet halogen lighting illuminates the counter tops.